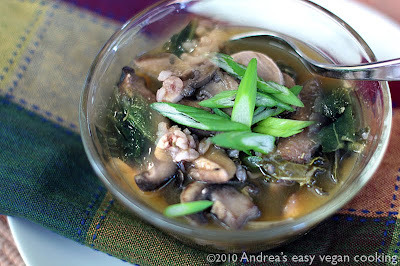 Andrea's Easy Vegan Cooking: Mushroom-garlic-kale soup etc. With the soup we had a salad of mixed greens, cucumbers, carrots, celery, grape tomatoes and olives. We also had baby back ribz— a tester recipe for Celine and Joni's upcoming cookbook. They are supposed to be all sticky-gooey with barbecue sauce so I slipped a little on that score but they were still delicious. Since I'm mentioning tester recipes, here's one for mock tuna salad made with tempeh. It didn't taste like tuna to me but it tasted great! Above you see a bowl of quinoa soup we were served for dinner by our son and his girlfriend. It's topped with chopped peanuts and avocado, and is a favorite of mine. It's a traditional Ecuadorian food, and you can find a recipe for a very similar soup here. For dessert we had chocolate peanut butter pillows from "Vegan Cookies Invade Your Cookie Jar" but I was so fixated on eating my cookies that I completely forgot to take a picture. Too bad, because they were gorgeous! This is try #2 of frito misto. I really liked this version but it's still not perfect. Sigh. Last but not least, we just couldn't give up on Turnpike Pizza's vegan (Daiya cheese) pizza without giving it another chance. The idea of vegan pizza this close to our house is just too alluring. So we tried again, this time telling them to go light on the cheese and heavy on the mushrooms. The resulting pizza was MUCH better. It had large slices of tomato and much less cheese. For some reason, the crust seemed completely different, too. It was not the soft-pretzel dough of our last experience, but a much chewier, crispier version of pizza. I wonder, if we order again, what our pizza will be like. Cook the rice in 1 cup of water and set aside. Sauté the fresh mushrooms in a 4 quart soup pot for about 10 minutes or until they start to release their juices. Add the sliced garlic and cook 1 minute. Add the vinegar and cook until it is almost evaporated. Meanwhile, gently squeeze extra water from the dried shiitakes and thinly slice them. Add to the pot and sauté 1 minute. Add the broth and 2 cups of mushroom soak water, leaving any dark residue behind in the bowl. Bring to a boil then reduce heat to simmer for 20 minutes. Add kale and simmer for 10 to 20 minutes, or until kale is tender. Add beans and rice. Bring soup to desired temperature for serving. Stir in green onions and lightly cook them for a minute, or use them as a garnish. Add salt if needed and freshly ground black pepper to taste. I can't write a post without encouraging all the generous bloggers out there to make a contribution to help the people of Haiti recover from the horrendous earthquake. Here's a list of trusted places that will put your money to good use. Even a small donation will help. The American Institute of Philanthropy (AIP) announces its top-rated list of charities involved in Haitian earthquake relief efforts. AIP, a leading charity watchdog that issues letter grade (A+ to F) ratings of nonprofit groups, identifies the following charities, which are providing aid to the victims that receive an “A” or “B” grade based on the portion of their budget going to program services and their fundraising efficiency. Contact the organizations below for information of specific relief operations now underway. Habitat for Humanity International – N.O. Wow, thanks for all the gorgeous photos of food...that bread looks simply wonderful and both soups look and sound fabulous...I'll be giving those a try for sure. And thanks too for the charity rating info...I always wonder about that...we went with Oxfam-America and HSUS. Thank you for the soup recipe! And thanks also for the charity rating. Our major donations go to AJWS because we think they do such good work, and it's really good to see it gets an "A" rating. I thought of your Daiya pizza yesterday when I made pizza at home. I still haven't found a "cheese" I like, and was perfectly happy with pesto and vegetables. Wow that bread looks fantastic! I tried to find out what kind of wheat we have here in Germany, but it seems not possible...the grains are not red or white, they are golden. Whould that be white wheat? The ribs and bones on the tester site really creeped me out, I like your taro substitution. ROSE- You're welcome. My family really enjoyed the soups and bread. I went with Oxfam and Mercy Corps but I'm going to give money to Partners in Health, next. And I'm participating in a vegan bake sale next weekend. CLAIRE- AJWS seems like a great choice. I'm supposed to receive samples of yet another vegan cheese this week - made from oats! I kind of like Follow Your Heart and Daiya, used in moderation. MIHL- The grains don't actually look white, but white whole wheat is a specific variety of wheat. You can really use any variety of whole wheat - your breads are always gorgeous. I've found that white whole wheat seems to produce a lighter bread. I even use it instead of whole wheat pastry flour. The sticks kind of creeped me out a little too. On the other hand, it's kind of funny - like a seitan Halloween costume. SO MUCH GOOD FOOD! You've got me drooling over here. I've been in the mood for a nice hearty soup lately, this recipe looks PERFECT. Thank you! I googled for pictures of the grains and it seems that wheat grains in Germany = white wheat and not red. I know, I can use any whole wheat, I was just curious about what the German equivalent might be. Thank you and lol about the seitan costume! TASHA- We made so much of the mushroom soup to get the recipe right I seriously wish I could give you some. We've eaten a LOT of it — good thing we really like it! Mihl- Of course I wasn't thinking. The wheat in Europe is usually white wheat, and here it's usually red. The kind I use is a hard white wheat. I don't usually add unbleached flour to bread but did in this recipe to stay closer to the original. It's only been fairly recently that white wheat has gained in popularity here. I wish I'd been one of your guests! The food looks wonderful! And I have to try that mushroom soup! Interesting to see the charity ratings. We give to Save the Children every month, so it was good to see they got an 'A'. Oh, Yum! That sounds like you have been cooking a lot lately! Everything looks oh so delicious and interesting. I love the look of the mushroom&kale soup and it sounds terrific, I can't wait to give it a try. I've been so much in love with kale lately. That last soup picture is beautiful! Thanks for the link to your quinoa soup; I have so much 'wa in my cupboard, and it sounds really good. Lucky you with your Daiya pizza! PENNY- If you ever find your way to the U.S., look me up. I'd love to have you as a guest! JILL- Thanks! It's really handy to have a big vat of dough in the fridge for making bread. It might be a little hard on a backpacking trip, though. ORAPHAN- I love kale, too. It tastes great, is versatile, and is so healthy. MARY- Thank you! Boy, as much as I loved that soup, I was sure happy when we finally ate the last of it. Testing recipes has its drawbacks. We had the quinoa soup for the first in Ecuador, made for us by the family our son was living with. In Ecuador it usually includes guinea pig (not when we had it). Bleh. I saw that soup in Vegetarian Times and have been wanting to make it. All of your food looks so delicious! And I appreciate the charity ratings as well. I have a booth at a local Farmers' Market (Hollywood) with vegan baked goods, and we're donating a portion of our sales for two weeks to Doctors Without Borders - I was glad to see they had an "A"! Oh my gosh that soup looks sooo yummy and filling. I could go for a bowl of the warm stuff right now- it's freezing and raining around here! KIM- I wish I could shop at your booth! It's really generous of you to donate some of your profits to Doctors Without Borders. TRINITY- The soup is pretty easy to make and tastes so good, I'm sure it would warm you up! Yes, yes, and even more yes!!! Wow, you really do eat well in your house! The ribz are just adorable, gooey-sticky or not. Were they fun to pull apart? ;) And I can't wait to try the mock tuna, too. Glad the pizza was better (if not great) the second time round. Oooo, Kale. Love the mushroom soup (not that I followed your recipe, exactly, of course, but it was inspirational). PENNY- Thank you Penny. I will get to it as soon as I can! RICKI- Seitan doesn't exactly "pull apart" :) but it was satisfying to cut apart! I wish you could eat wheat because the ribz were really delicious. And they made the best addition (cut into small pieces) to Chinese vegetable bowl. ELENA- Inspiration is the point of most recipes, is it not? I'm thinking of your peanut stew, and how it inspired a similar, but different, stew at our house. Of course, sometimes I do follow a recipe exactly (almost) at least once, before I change it. And sometimes a recipe is so good, it remains intact forever. (kind of) You know what I mean. Andrea, I found your website yesterday when I came back from the market and my kids had picked out portobella mushrooms and kale. I always let them pick out a veggie and then we find something to make with it. Your soup was amazing, we used jacob's cattle beans because that's what we had in the freezer. It was a resounding hit, thanks so much! I'm so glad you liked the soup as much as we did. Thanks for taking the time to leave a comment to let me know. Letting kids pick out ingredients and help with recipe selection and cooking is the best way to encourage them to be healthy eaters and good cooks! Thank you for your support. If you click on the subscribe button on the top left hand side of the blog page, you should be able to receive an rss subscription. Or you can create a blogger profile for yourself at blogger.com and add the blogs you're interested in reading to your "reading list." That's what I do. My pantry required me to make a few changes. I used seasoned rice vinegar instead of brown rice vinegar, and butter beans in place of cannelini beans. I opted to replace the green onions with leeks, which I added along with the garlic to saute. The result was absolutely wonderful. The vinegar flavor, mushroom water, and veggie broth resulted in a great soup base which really didn't need salt. Thank you for sharing the recipe. I love it! Sounds like good substitutions! I never buy seasoned rice vinegar because I prefer to control sugar and salt additions, but I'm sure it added a wonderful flavor to your soup, especially if it contained mirin!